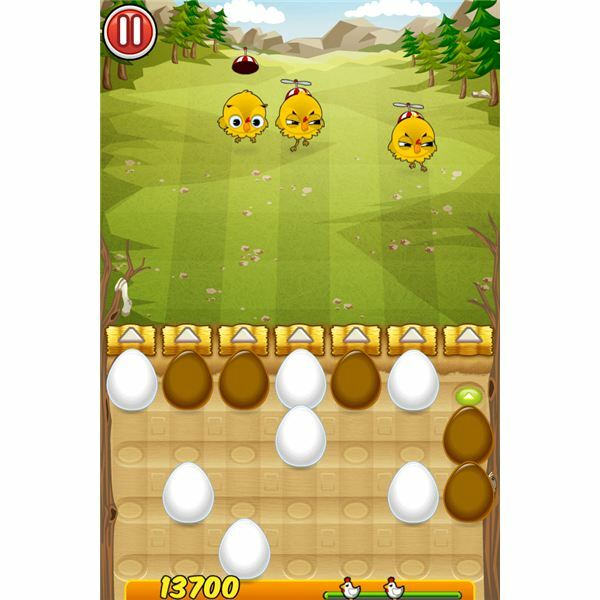 Egg vs. Chicken is a new iPhone game which combines three types of games – match 3, tower defense in the likes of Plants vs. Zombies and a slide-the-tile game. 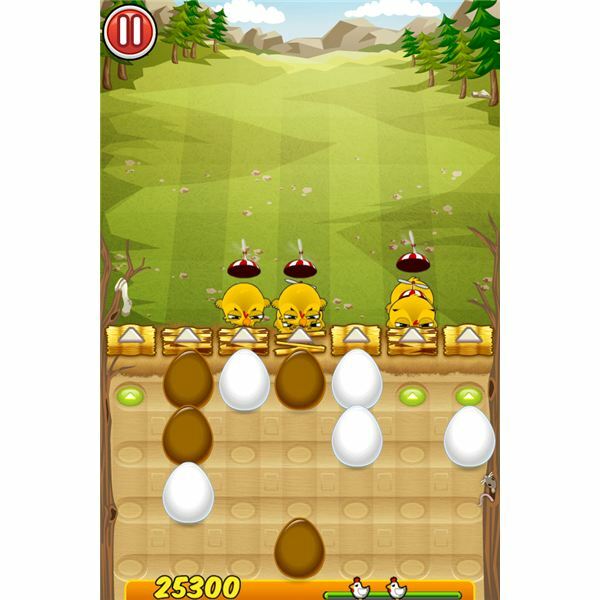 Add in some nicely done and cutesy looking graphics with various chickens and several colors of eggs, and you have an entertaining and addictive, easy-to-play game. Let's get to the point of the game. The game screen is divided into two parts. The upper portion has some mean-looking chickens who are gradually approaching the lower portion of the game screen, where you have a grid populated by various colored eggs. Your task is to prevent the chickens from touching the edge of the grid which the eggs are filling up. You know what happens if you fail to do so, right? – Game over and you will have to restart. To prevent the chickens from attacking you, you simply have to slide up the eggs towards the chickens. But it's no simple task, since you can only slide three similar eggs in a three formation. These three eggs can either be lined up vertically or horizontally, and when they slide up will blow the chickens into smithereens. To arrange the eggs into three matches, you can simply slide them towards the position, which will make them form into sets of three similar eggs. After this you are free to fire up, towards the rampaging chickens. While this game may seem simple, well think again, as the game gets pretty interesting as you reach the later levels – the game is neither simple, nor too easy. But a lot of it has nothing to do with the game play. In fact, I find the game play quite solidly built. But since this is an iPhone game, the phone's screen size is somewhat limiting the overall mechanics of the game. This game will certainly look and play nicer on the iPad. But then again, I'm not saying that Egg vs Chicken is not a good game. On the other hand it is a great game with nice graphics, an ample supply of special eggs, and other goodies including power ups. The game also has in-game purchases enabled. So, you can buy cool items that you can use during the game proper. Another good thing this game's got going for it, is the fact that is is very fast-paced. You can easily end the game abruptly if you don't act quickly in arranging the eggs and firing them up towards the chickens. It's a good thing that you can freely eliminate unnecessary eggs that are otherwise hampering you from creating three matching eggs. You simply double tap on the egg and it will be eliminated. Overall, Egg vs Chicken is a pretty solid game, with several nice features and a high entertainment game value. The 12 levels may be too short, but I'm pretty sure that this game is up for more updates in the near future – similar to what Rovio did with Angry Birds. In fact, I can't help but thinking of the said game while playing this one, despite the fact that they have different game plays. If you've finished Angry Birds Rio, Egg vs Chicken is a great filler until the next edition of those hopping mad avians comes out. Image credit: Screenshots provided by the author. Copyright remains property of developer.